So there I was…right in the middle of reading Henderson’s book “The Farming Manual”…and then…nothing. What happens next? Henderson tells us all about humane animal handling and teaches me a few things I was able to put to immediate use. But that’s for another time. And it’s not that I haven’t written anything. Oh, I have written. I have posts about why it is not economical for me to fill the hog floor, posts about cows that came up open and what it means to our herd, posts about books, posts about my daughter. I have written. But I have not finished a single one of them. And why? We were (maybe are) in a season of rest. Our days are largely the same. We make four trips daily to the chickens out in the pasture. We see the sun rise at the chicken house, we see the sun set at the chicken house. In between we feed, water and collect eggs. Chickens follow the cows on the pasture, scratching through the manure, “spreading repugnancy zones” to quote Salatin. Look, I don’t know about repugnancy zones. Looks to me like the chickens spread out the piles to eat worms and maybe that’s good but maybe I need more worms. Maybe I don’t need chickens. Maybe I need longer recovery windows. I don’t know. I can clearly see that cows don’t eat near cow poop unless you starve them but…well, what is the relative value of living worms compared to decaying chicken manure? I don’t know. So I write about what I don’t know. This should give me plenty to write about but…well, it is a little embarrassing. Worse when some major web site reposts something I wrote, making my ignorance available to a wider audience. But I want to know. I want to understand. I don’t want to just do what grandpa did. But what else is there to say about cows? They move every day. When the grass grows quickly, the cows move quickly. 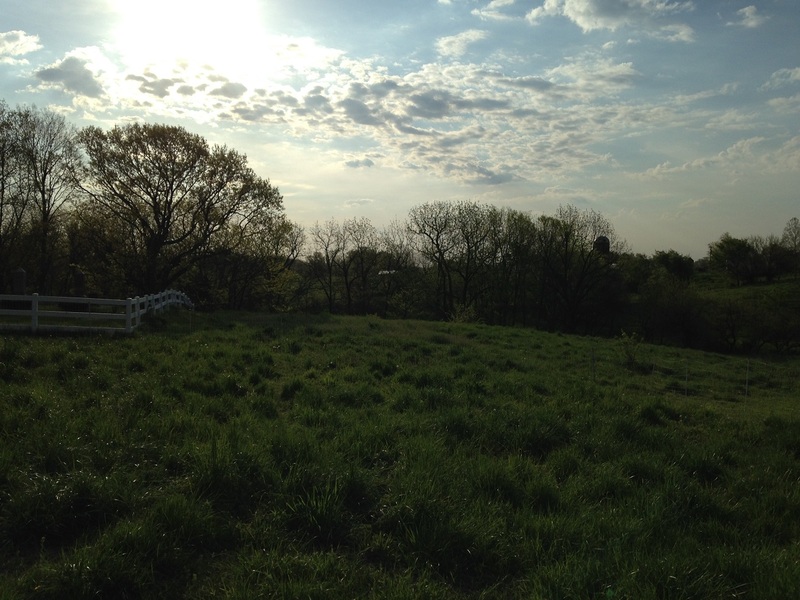 Right now (3/12/16) the pastures are greening up. Half of my farm is still stockpiled from last fall. We are accelerating our grazing pattern and it won’t be long before we begin to cover the whole farm every two weeks. But right now we are holding back, protecting our tender, emerging grass as the season changes. Is there a blog post in that? Sure. But…I feel like I have already written it. So what would I write about instead of another post on the consistency of cow poop? I could write about all of the things we are not doing this season and why we are not doing them. We do not have broilers this spring. Our daughter’s treatment schedule would not allow us the opportunity. But in a normal year we would have broilers on pasture already. I would be waking up on a frosty morning like this, preparing to move chicken tractors, hoping they didn’t all pile up and kill each other overnight in the cold shelter. Praying that a skunk didn’t help himself to a buffet overnight. Usually we are pleasantly surprised that the birds are warm, safe and dry in the chicken tractor. But this year without the birds, everything seems kind of empty. No drive to Iowa in a blizzard. No brooder maintenance in freezing weather. We are not marketing birds to be processed on April 23rd. Nothing. I raised 5 pigs over the winter on the hog floor, mostly as an experiment. Could I raise them in a way that satisfied their needs to dig and forage on a concrete slab? Could I raise them there in a way that satisfied my needs to pay taxes and buy shoes? I may answer that question in a detailed blog post later but the short answer is this: The pigs are all leaving the farm on Tuesday. 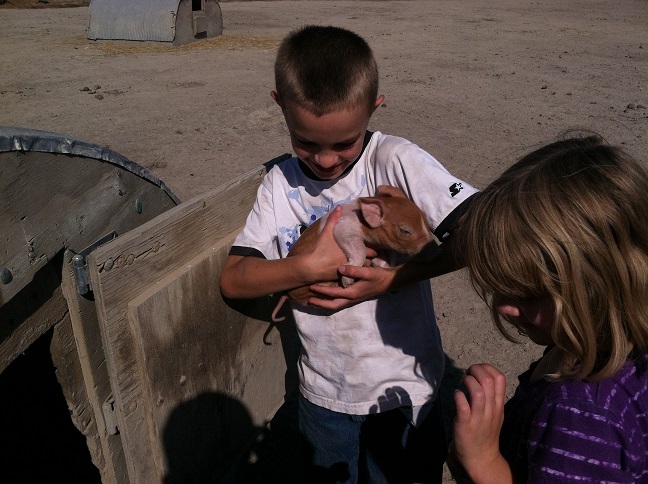 I doubt I will have pigs again until August at the earliest. Where is the encouragement telling those starting out that they, too, can succeed? Has it run out? Not really. I mean, you can do it. It is possible. But I am no shining example of success. We sell all of our eggs but $5 eggs are no way to make a farm payment. It’s just something to do. An excuse to walk out to see the sun rise in the morning. Something to do while holding hands with my bride, watching the sunset in the evening. Our daughter’s illness has been a major distraction from everything else in my life. I feel that my job performance has suffered. I am not blogging. 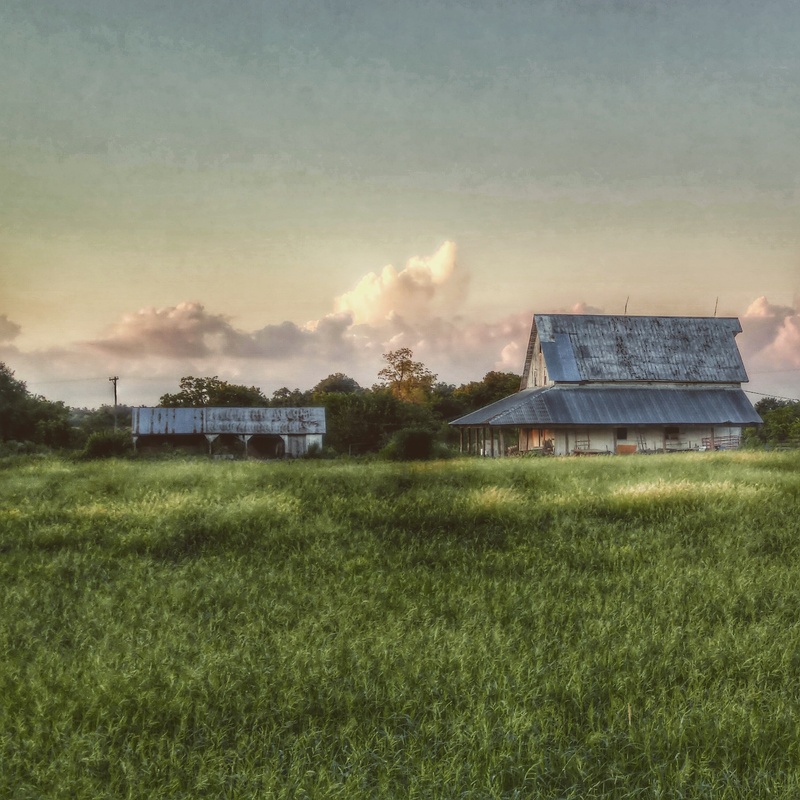 The farm has been pared back to very, very little. Even my reading has slowed down considerably. So that’s where I am. Away for a season. Away to evaluate what is important to our family. Writing blog posts, like raising pigs, does not pay taxes or buy shoes. But I feel that it is important that I leave this as some sort of legacy for my children’s children. A way for them to pick my brain. I really don’t know anything about my great grandpa Jordan. His name was Arthur. That’s about it. So what about my great grand-children? “Who was great grandpa Jordan?” they may ask. “Did he have insecurities? Did he struggle or was everything easy for him?” Yes, I have insecurities. Yes, I struggle. I drive away from farm and family every day to pay taxes and buy shoes. I come home to clean and pack eggs, plan out grazing, work on the well pump, carry hay, scoop manure, fold laundry and wash dishes. Each day is largely the same as the one before. But that doesn’t mean we are bored…or that we are boring. But we are busy. But busy and productive are not the same. I would want my children to know that I am not always productive. I am not always successful. I sometimes struggle. Some mornings I have a hard time getting out of bed. Some evenings I am asleep at 8:30. Sometimes I drag a book out over a few weeks. Some seasons are for rest. But then the season changes. Seasons change. And our season is changing. 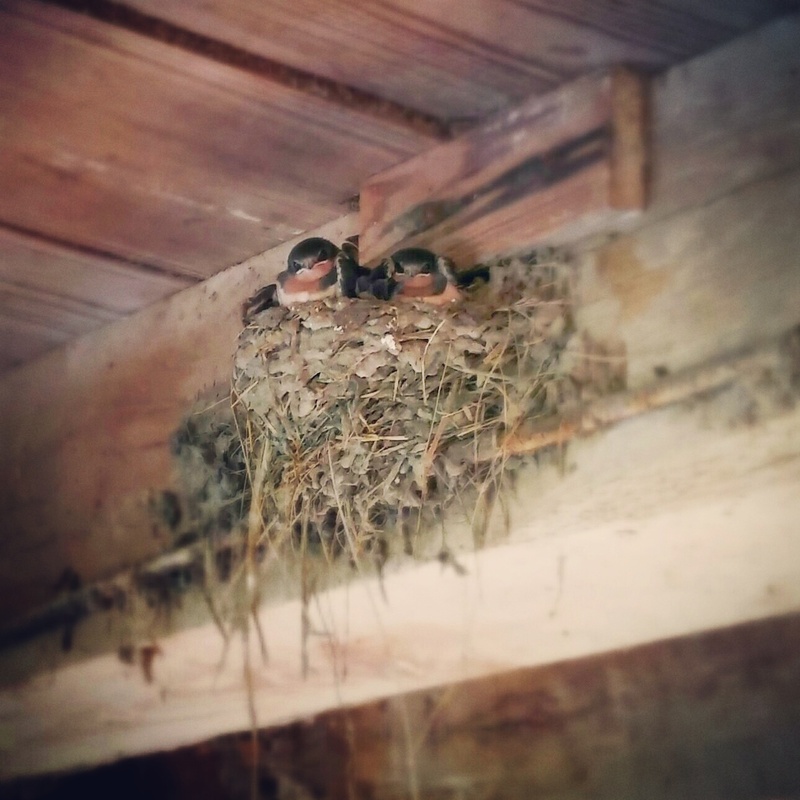 These little guys kept an eye on me while I did the milking. 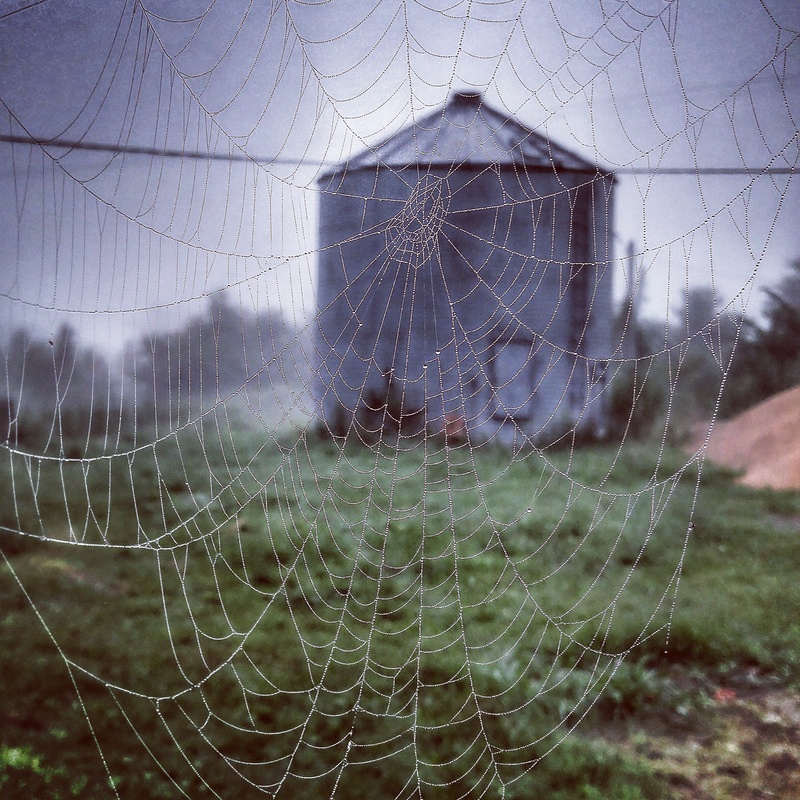 You can tell the end of summer is near as the spiders are getting busy. With all the rain we have had this summer all the water insects seem to be happy and doing well. The camera is a limited tool…and when I say “camera” I mean phone. It only captures a moment and it often captures that moment incorrectly…without context. There are no sounds, smells or emotions. Just a little slice of the morning. What was really happening that morning? What did the camera miss? It was cold. The weather has been warm but that morning was chilly. The air smelled fresh. There was very little wind. Buffalo Gnats were beginning to hatch and bite. Julie has an oil that works great but those darned gnats are just awful. They are the reason we raise our broilers so early in the season then stop. Our first year the gnats were particularly thick and we lost a number of birds to them. They bit under feathers and choked up airways. Dad and I were standing in the driveway one evening wearing bee gear butchering birds as fast as we could as the gnats found their way through our armor. We don’t want to go through that again. Ever. So we start chicks on Valentine’s day…which has its own drawbacks. But we know the seasons of the bugs, the plants, the frost pockets, the routine on this farm. So the picture above doesn’t capture the relief I feel knowing my chicken tractors are empty. My brooder is empty. My freezers are emptying. It’s a great feeling but hard to capture on film. Mom and dad were gone to visit grandpa Jordan so I had extra chores that morning caring for their dogs and horses. The picture doesn’t capture how I feel about that…delighted. Dad lets our dog out if we are gone during the day. Dad checks livestock water even when we are home. Dad closes the chicken house for me sometimes. He has even offered to milk. I’m glad I can help them out…unless they need tech support. The picture shows knee-high grass. The picture doesn’t show my anxiety about grass. The grass wasn’t growing fast enough for my level of patience. Cows were somewhere out there in one of dozen or so temporary paddocks I set up. Shortly after I took this picture we went through a dry spell so I increased the rotation time from 12-14 days to 20 days. Did I slow down too much? Did the cows start taking too much off of the pasture? The picture doesn’t know. Julie was gone that day too. She had flown to a conference in Salt Lake City. The picture doesn’t know I was missing her. Because we are early risers, and because she had flown west, she was the first one awake at the resort. She and I chatted while she drank coffee and she commented that the sounds were all alien there. And the birds were radically different. For example, we don’t have magpies here. Somehow you don’t think of the specific species and sounds that surround you when you think of home. Here the spring peepers (Pseudacris Crucifer) make a loud chirp in the distance and cricket frogs (Pseudacris triseriata) trill away night and day. The birds make familiar noises. While Julie was surprised to see a porcupine in Utah, I’m not surprised at all when I scare up a rabbit or quail in the tall grass or see a skunk in the early morning. Those are familiar animals. The picture doesn’t capture the feeling of familiarity with the environment. In my mind the picture above looks like home…but not just by sight. Oh, there are familiar things in the picture. Grandpa harvested walnut trees when he and grandma were married. There is still walnut lumber tucked away here and there. Further, grandpa had a bulldozer. Most of our walnut trees grew after that. I enjoy the burr oak behind the cemetery and the cemetery itself. The adults couldn’t hide Easter eggs in the yard because we could always just peek out of a window to see what was going on so they hid the eggs in the cemetery. Weird, I know, but that’s part of my childhood. And I see these things when I look at that picture…even though they aren’t visible. Heck, just down the hill from the burr oak (that large, spreading tree just behind the plastic fence) is a small grove of walnut with no lower limbs below 12 feet. Grandpa’s herd was in that pasture when I was 8 or 10. I didn’t know they were there but I was well trained to fear the bull, Leroy. 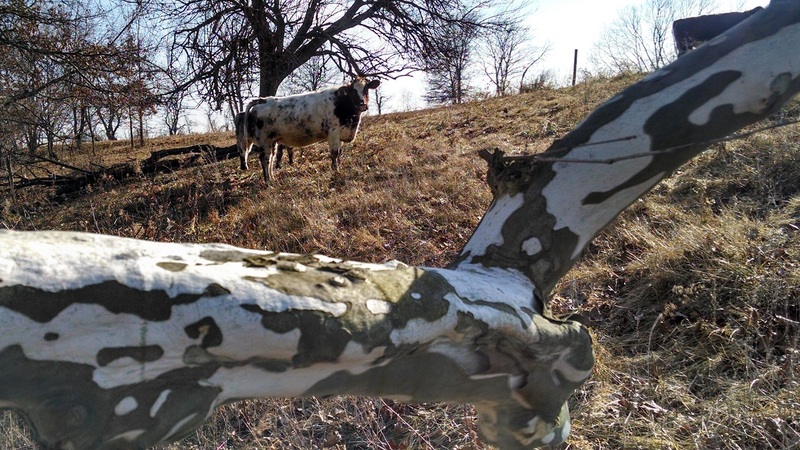 I was walking down to play in the stream when I realized my mistake…I was surrounded by cows and too far from the house for anyone to hear me. I tried hiding behind a tree. The cows walked around to the other side of the tree and looked at me some more. Eventually the cows realized I didn’t have any food and decided to seek their entertainment elsewhere. I felt stupid, went back to the house, washed up and ate some frozen fruit salad during the October cemetery committee meeting/family reunion. Do you see that in the picture? Do you see the sledding I have done with my children on that hill? Cover the hill with snow. We gather just at the crest near the fence, pile onto a sled all together and try to avoid thorny saplings as we disappear out of sight. The camera has no idea what I am talking about. 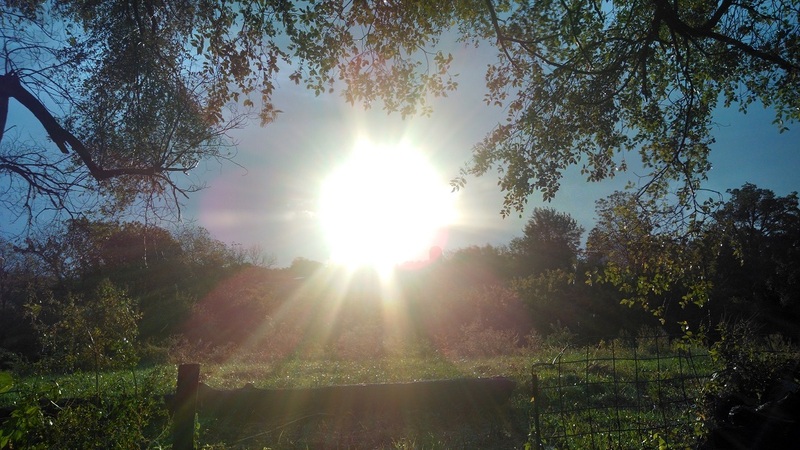 The picture only knows about the sun rising over the trees in the distance, plastic fence around a cemetery, green grass, poultry netting and a chicken house built by three generations of Jordans on a hot day last summer. But so much more was happening that the camera missed. So much more happening every morning. And I just don’t have time to stop and write it all down. So the camera does what it can to help me. We are hunkered down in the cold. In fact I am, perhaps, too hunkered…as in too hunkered in front of Minecraft. But that’s how it is. And I’m not the only one. Dad put plastic around the chicken house. These old biddies shouldn’t even be alive at this point. There are 50 birds left laying maybe a dozen eggs each day and they all need to go to the stew pot. At this point we’ll probably just butcher them with the broilers in April. Anyway, they are toasty and warm sitting inside their shelter. 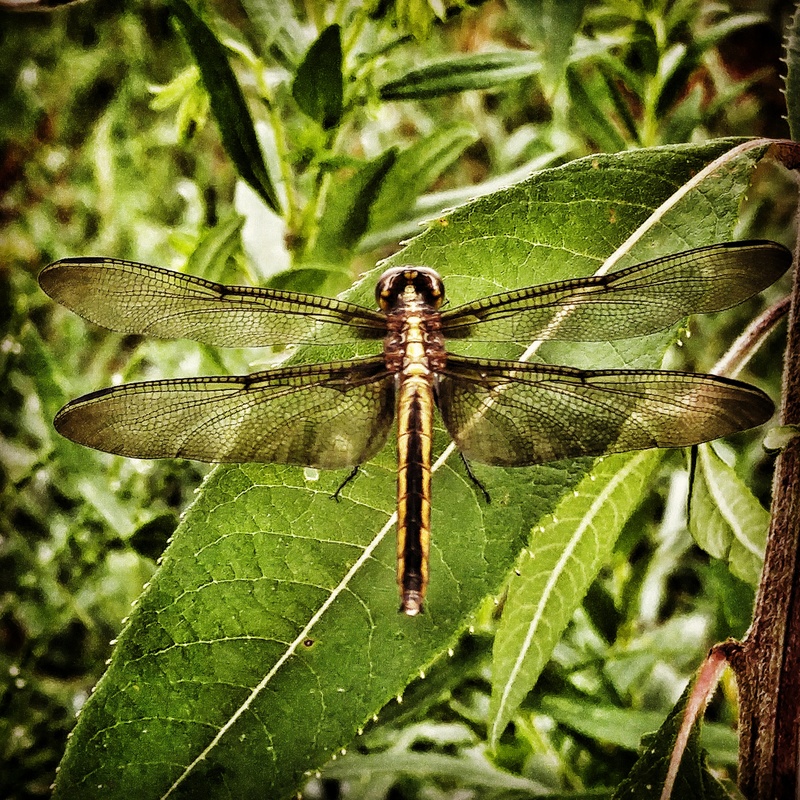 They come out to eat, drink and to lay eggs. Otherwise, they are on their roosts. The cows are in a similar situation. We have been adding and adding to their bedding day by day. While they are out eating I stay busy adding bedding. I want them to be clean and warm. I also want to capture the nutrients as effectively as I can so I can apply them to my pastures in the summer. 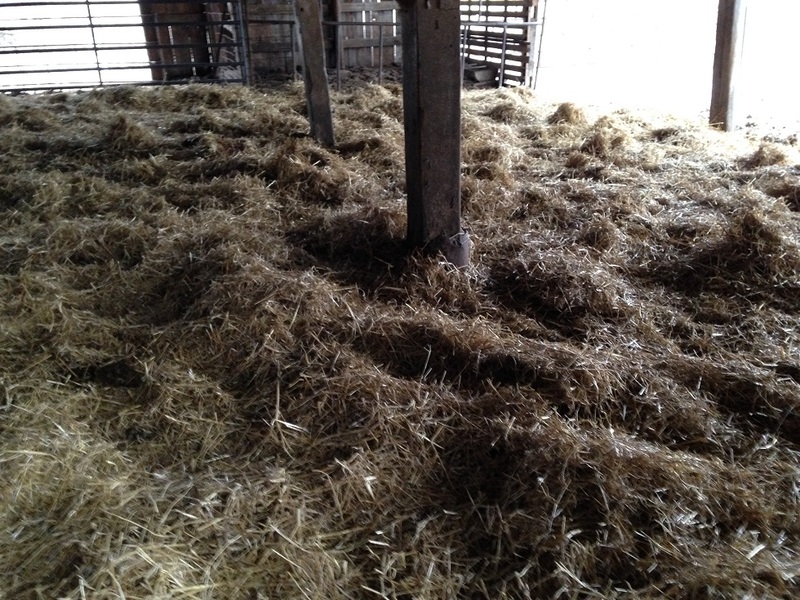 I think we paid $1.50 for the straw so each day they are in the barn costs me $4.50 in bedding. The fertilizer we are collecting is worth many times that amount. Plus the savings of labor and the health and comfort of my cows in the cold weather has value. The jerseys, specifically, are not as cold-hearty as one might like but the shorthorns don’t seem to mind the cold. Matron has wrote a nice post about deep bedding recently. I don’t have much to add except to say that we do the same thing in our greenhouse for the main layer flock. The bedding in the greenhouse is so deep we really just add water and feed at this point then collect the eggs. The living mass of bedding seems to be assimilating everything that falls on it and is releasing no odor. Pretty cool. No picture though. Egg production is increasing rapidly now. It’s a little scary in the fall to see egg production drop and know customers are going to be disappointed. Now we have to gear back up, hoping those old customers will be interested again. Ugh. So hard. So we carry hay. We shake out bedding. We fill water. We carry feed sacks. We gather, wash and pack eggs. This week we put chicks in the brooder so we spend a fair amount of energy making sure those babies are warm and well fed. But otherwise we just try to stay warm. It’s so cold the kids aren’t even sledding…much. Good times though. It’s going to get really busy soon. Rest while we can. This weekend I’ll rest by parking my tookus on the couch with a small stack of books and I’ll tell you all about it on Sunday. It’s going to happen again. Valentine’s day. Julie’s February birthday. Shoot. I need to plan for that somehow. Two weeks. No idea what to do this year. Chocolate covered strawberries? I still don’t know what to do. Just…you know. And you do know, don’t you? I love you. I love you a lot. When we read Love Languages we identified what yours is. But that’s not mine…so I don’t know how to do it. Quality time? What do I do? Just hang out? I have stuff to do. Can’t we go do that stuff…but together? Doesn’t that count? Now what? OK. Maybe I could give them a block of diamonds in Minecraft? I could code in an unbreaking pick axe for both. Hmmm. What are their love languages? The older girl likes to cook. Acts of service? The younger one is a snuggle bunny. She likes to be with me, holding my hand when walking. She usually gets up when I do and she stays near me. But the older one? What is her language? How can I make her understand that I love her? How can I meet her at her level? Bake cookies together? Zucchini bread? Julie, do you know that I love you? I love you every day. Why do I feel all this pressure on some arbitrary day in the winter? I love you. Julie found this in my drafts, read it and asked me to omit certain details. Particularly a note about how great she looked in her workout clothes. So I took that out. But still, she looks great. Shoot. It’s here. It happened. There was some discussion about going out to dinner or going to a church activity or something. That’s not what I had in mind. I thought we could get a couple of steaks and a bottle of wine and just spend the evening together at home. She got some steaks from Steve today and asked me to pick up a bottle of wine on my way home. Wine is difficult. I could get the $5 bottle of funky stuff that smells like a wrung out gym sock or the $10 bottle of funky stuff that smells like a wrung out gym sock or the $4 bottle of sweet red who knows what that doesn’t taste too bad and isn’t too sweet. $4 it is then. What a great date I am. Let’s revisit that chocolate-covered strawberry thing. Maybe that’s something I could do with the kids. I think “With” is more important than “For”. With. OK. Good deal. Need a bag of white chocolate chips and a bag of milk chocolate chips. OK. The whole Valentines Day, Dad/Husband thing is in good shape. If you haven’t figured out Valentine’s day for yourself I’ll leave you with some words of wisdom from Brak. Back to the Barn. Again. I keep the cattle on pasture as much as I feel like I can. Feel. We play it by ear. I don’t want to pamper my cows but I also don’t think it’s good for them to be out in rain on a 33 degree night when the temperature is dropping. Especially when it’s so easy to just open a gate and stand up a temporary fence so they can be warm and dry in the barn. I am also concerned for the pasture itself. Plus, it’s no fun walking way out in the pasture to check cows when it’s sleeting and the wind is blowing. Let’s save the farmer (Julie) a little trouble. Saturday’s forecast keeps changing from 3-5″ of snow to half an inch of rain and back again. They can’t seem to decide. Either way the cows will come in Friday evening. No soupy pastures. No cold, muddy cows. Take a look at the picture above. That’s fresh ground. The cows are always moving to fresh ground. There are good root systems under the standing grasses, plenty of stuff above ground…we don’t let it get all trampled, manured and soupy. It is getting torn up around the mineral feeder though. That’s on me. For the most part, we are adding manure without degrading the forage stand. That’s a big part of the plan to move cows in before the storm. Friday morning or Friday evening I have to find time to move a dozen or so square bales of hay to the cattle barn and a half dozen bales of straw. There is no loft in the cattle barn. 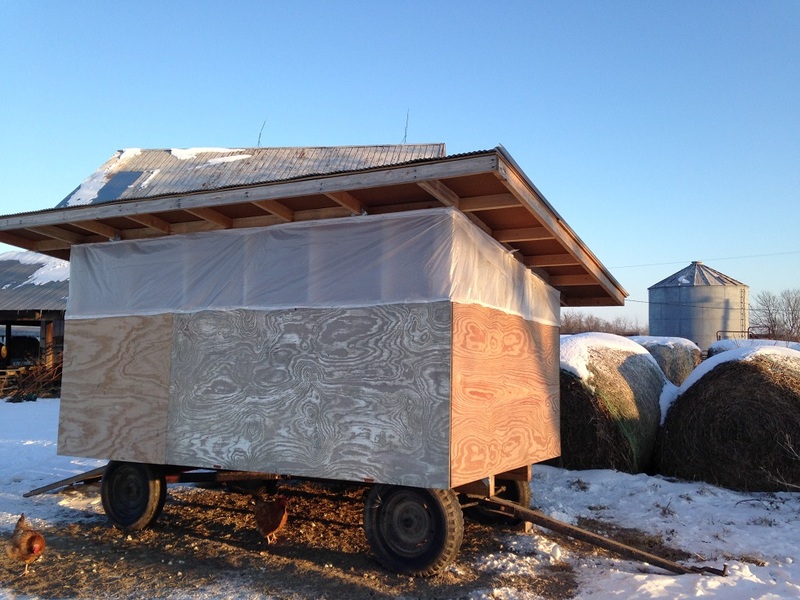 Note to self: Add “Build a loft in the cattle barn” in May to the year’s work list. Also add “Cut wood for loft with sawmill” in April/May and “Cut trees for sawmill” in February. Saturday the cows and I will be indoors. They will be chewing cud. I working my way through a small stack of books and a big cave in Minecraft. We had a wet summer. Don’t look a gift horse in the mouth and certainly don’t complain about rain in the summer…but Geez! We were two months late getting first cutting hay out. The alfalfa was all stemmy and went to seed. We didn’t cut until July. Even then it got rolled it up wet. It must have rained every three days…not a way to cure hay. 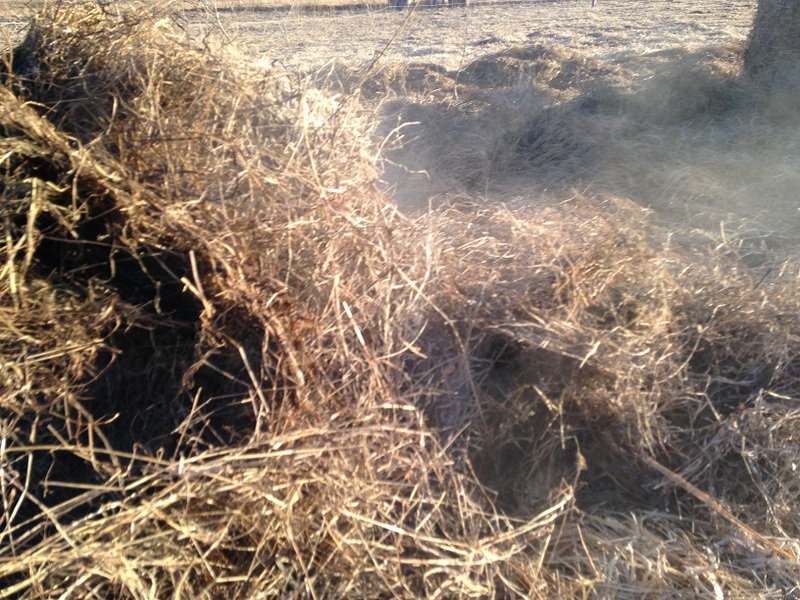 You reach a point where the future hay is negatively impacted by not cutting the old stuff. We were there. We had to get that stuff out so we could grow better next time. So my cousin cut and took his share. 30 bales of stems that were fat and woody and had fallen over onto the ground with new growth coming out of them. Awful stuff. Not a single bale I can feed to a cow out of the first cutting. But at least it didn’t burn up. I saw these at a friend’s house recently. He’s lucky it didn’t catch fire. Some years ago my cousin had sudangrass where he later planted the alfalfa field. There are still three or four black bales at the south edge of my property entirely blackened. It happens. What in there would catch fire you ask? Well, you have a wet mass of organic material. Biology begins to work. Life creates warmth. Respiration. Reproduction. Growth. Waste. Cellular Mitosis. The bale in this case is little more than a big compost pile wrapped in plastic netting. That can burn. So can a compost pile. So can a pile of wood chips. Half of my bales are only good for compost. So that’s what we’ll do with them. I’ll gather up the feedlot manure and make a lasagna with alfalfa hay and feedlot and bedding. Then we’ll spread that on the fields. The alfalfa all went to seed so that will be nice. The other half of my bales? Well…not so good. But not so bad. I just have to play it by ear and let the cows make bedding out of the bad stuff. Or let the chickens scratch through it. 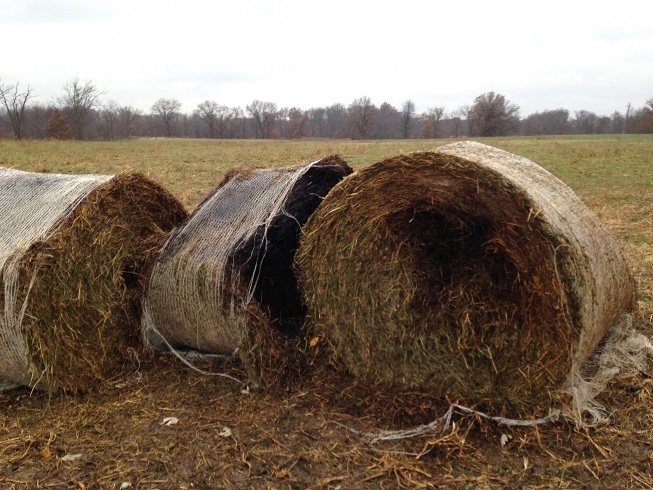 Sometimes the center of the bale is moldy but usually it’s just the outer 6-8″. I stand the bale on end and peel off the outer layers. See this smoke? That’s not smoke. It’s mold spore. That first 30 bales I was talking about earlier all sprouted mushrooms last summer. Compost is the only solution. I can’t even use it for pig bedding as it would make them sick. 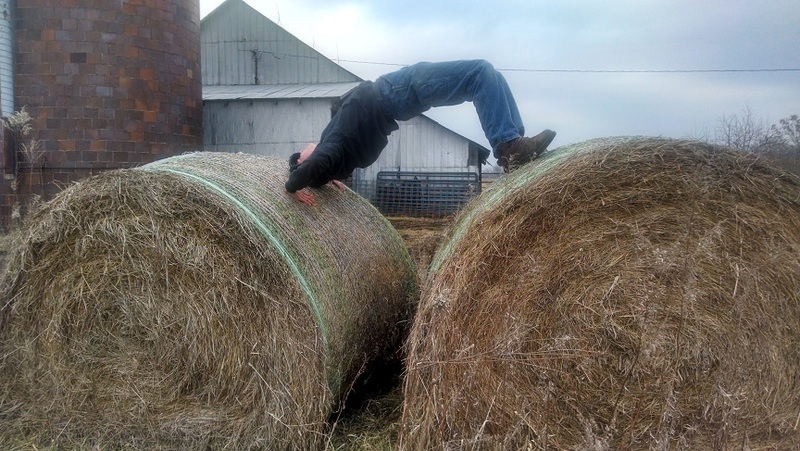 It’s hard to put up a good round bale in wet weather. Most of our small square bales are excellent though…this year anyway. Squares are easier to evaluate. You know what they should weigh as you lift them by hand. You can dig into the pile and feel for warmth or moisture or you can tear a bale apart and inspect it easily and you can move it by hand. 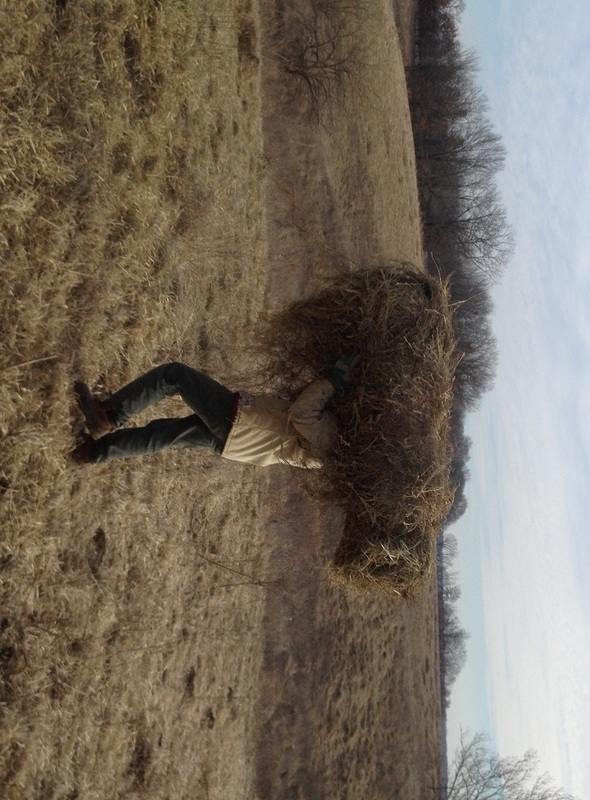 It’s hard to move a round bale by hand. Even just the center of one. At this point I’m tending to unroll a bale down the hill and just let the cows pick through it, making bedding of what they don’t want. Dad and I have some concerns about how long a thick mat of hay will persist on the ground but we’ll just have to play it by ear. Hopefully the chickens can scratch it out and the worms will decompose it. I don’t have any advice here. More than half of my hay is worthless. It’s hard to put up good hay, especially early in the season. I would prefer to just buy it in but hay quality is a concern there too. Maybe dad will weigh in with some ideas for how to ensure hay quality. Hopefully dad and I will have a better hay year in 2015, but still moist. Each year we get a thaw in January. That’s just how it is. We will surely have another bitter cold spell followed by a few big snows but we get a breather almost every January. We can get snow all the way up to May, frost as late as May 10. This week is just a breather. After that we have snow in the forecast. In fact, yesterday they were suggesting 5-8″ of snow on Thursday. But things change. The cows are back on pasture and they are happy about it. The ground is frozen and it’s hard to drive posts so Julie has been building each day’s fence around noon when things have thawed out a little. So far so good. Please don’t think I’m kidding when I say Julie runs the farm. Julie runs the farm. I just work here. I did build the next strip on the 18th and I’ll have a post about that soon. This is also a good time to check on my bees. I don’t write much about bees. I’m more of a bee owner than a bee keeper.